This Ace Double Western from 1963 gets off to a fast start with a brutal whipping in the main street of a settlement called Rocky Pass. That violence is interrupted by the protagonist, rancher Rick Dalton, and his interference deepens the conflict between him and the crew of gun-wolves working for the local cattle baron, Matt Iberg. Rick doesn't like the way Iberg is trying to run off the smaller ranchers in the area and take over their range, and the two of them clash as well over the affections of the beautiful Kit Rowan, whose half-brother is one of Iberg's allies. A bloody showdown seems inevitable. As you can tell from that description, THE BUZZARDS OF ROCKY PASS is a pretty traditional Western novel. As usual with the work of L.P. Holmes, you won't find anything groundbreaking in this one, but also as usual, it's so well-written and Holmes handles those traditional elements so skillfully that it makes for a thoroughly entertaining book. Holmes keeps up a relentless pace of tense confrontations, shootouts, fistfights, and desperate chases, slowing down just enough now and then to craft some believable romantic tension as well. Sure, I had a pretty good idea what was going to happen, but that didn't stop me from racing through this novel and having a great time reading it. 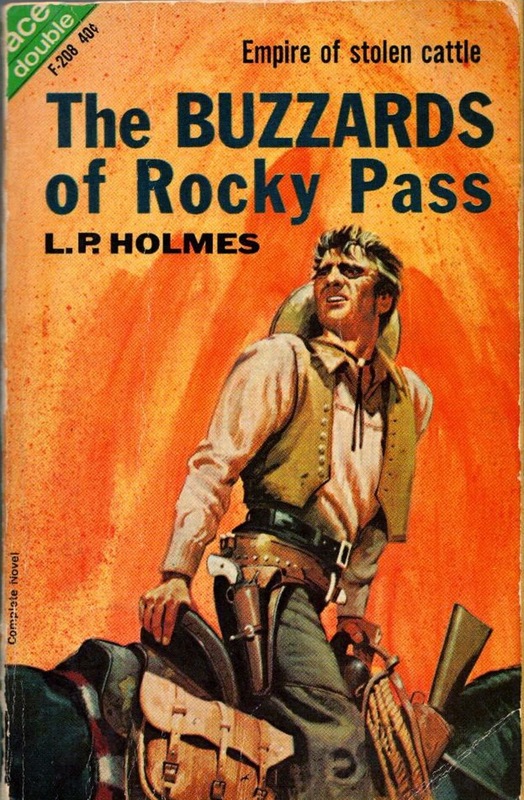 As I was reading this book, I had a very strong hunch that THE BUZZARDS OF ROCKY PASS originally appeared in one of the Western pulps. Its short length (about 30,000 words, I'd say) and relatively simple plot would have made it a good candidate to be published as a complete novel. Further investigation proves that to be the case. 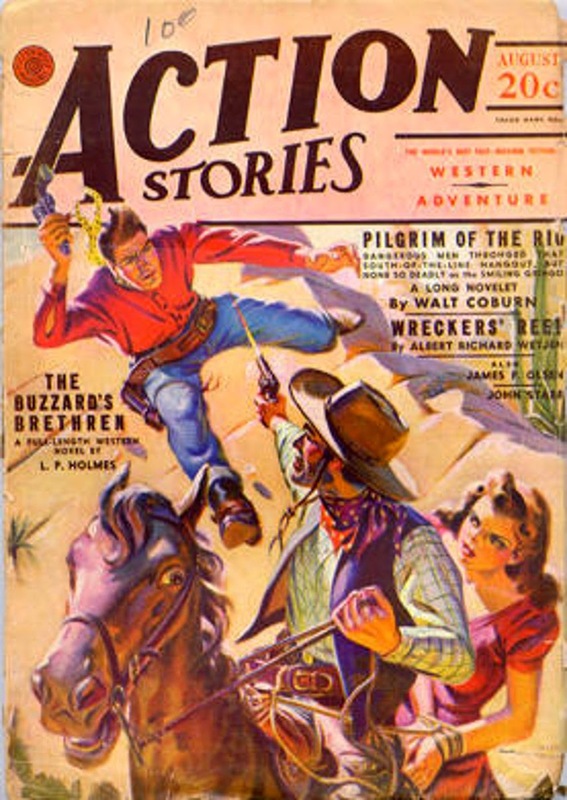 It was first published in the August 1941 issue of ACTION STORIES under the title THE BUZZARD'S BRETHREN. It was reprinted nine years ago under that title in the Leisure paperback RIVER RANGE along with a couple of other Holmes novellas. That edition might be easier to find than the Ace Double version. There's even an e-book edition that's still available from Amazon. But whichever way you pick it up, what's important is that this is a very entertaining yarn and well worth reading if you're a fan of traditional Westerns. By the way, the cover scan above is from the actual Ace Double copy I read. The other side is another L.P. Holmes novel, SIDE ME AT SUNDOWN. I'll probably be reading it in the relatively near future, as well as the other two novellas in RIVER RANGE. I have this ACE Double as well as a handful of westerns ACE published. Now...to find time to read them. Nice review!